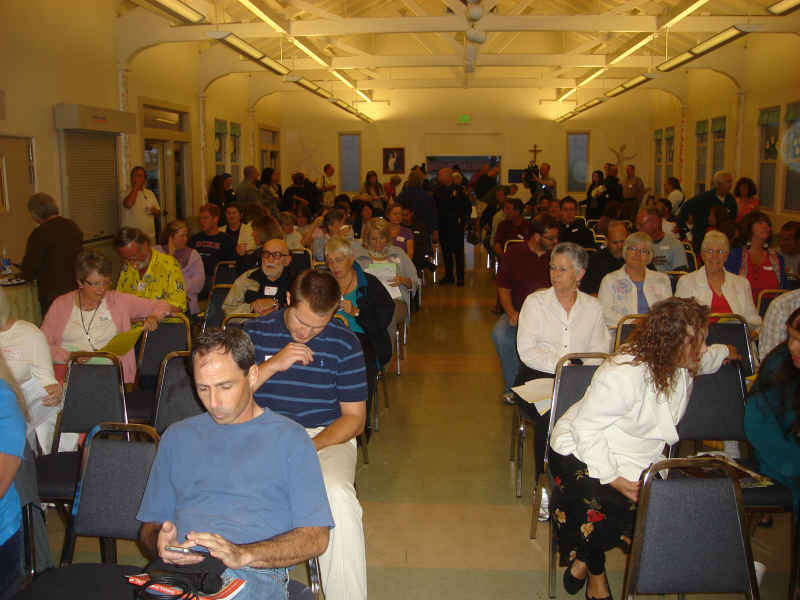 The church-sponsored community forum last night (Tuesday July 6) drew as many as 250 residents, merchants, homeless, and property owners to a discussion on OB homelessness. Volunteers signed people in as they lined up entering the lengthy hall, some homeless guys played music on the front lawn. Reporters mingled with attendees on the sidewalk. Many of OB’s active residents and business-owners were there – this was the place to be in OB on July 6th. Town Council members, the community relations police officer, the woman who feeds homeless people every Monday, OB Rag bloggers, seniors, middle-aged property owners, church volunteers. Christine Shames, a homeless advocate, brought a half-dozen young people who were homeless to the forum. Peter Callstrom of the San Diego Regional Task Force on Homeless with the new alternative "sticker." 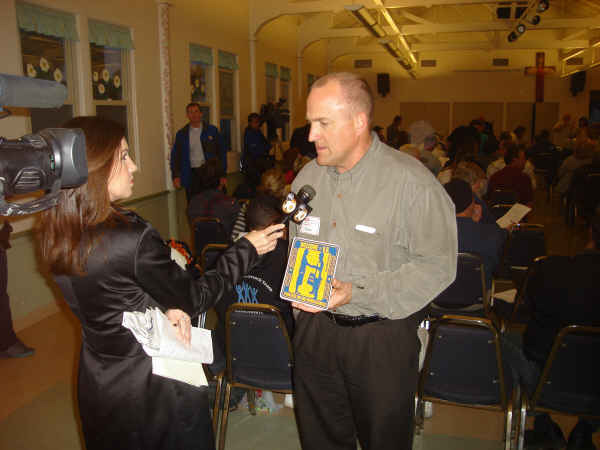 Peter Callstrom of the San Diego Regional Task Force on Homeless was there, along with some of his staff. They displayed the new “sticker” – the “We can end homelessness” image soon to be made into a sticker. Peter had told me that he’d like to see the new sticker sold in as many stores in OB as possible. “Even the Black,” he said. I replied that we’d call off our boycott of the head shop if they did sell the alternative. 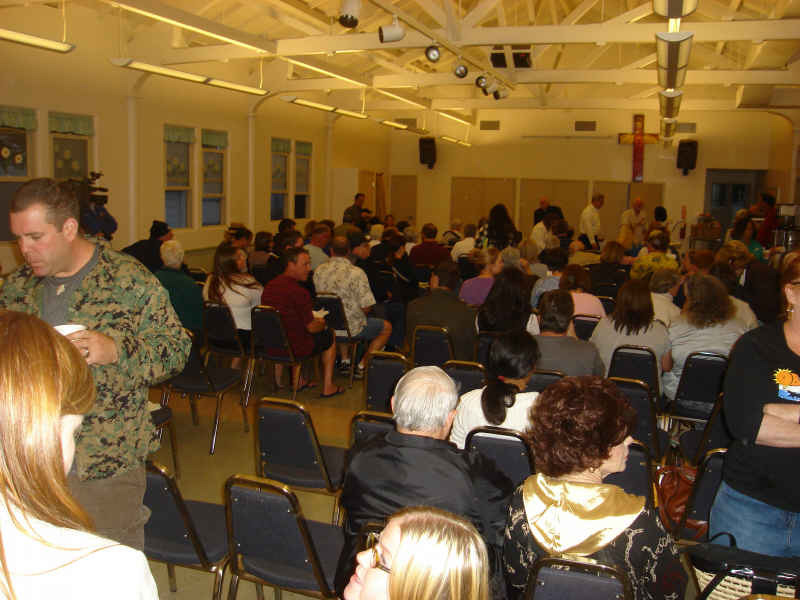 As television cameras and their trucks were parked outside the Parish hall of Sacred Heart on Sunset Cliffs Boulevard, Father Ron Hebert of the Parish gave a warm welcome to the standing-room only crowd. The church had generously offered up their space for the gathering, – coffee, cookies and brownies filled a side table. Jack broke the hall into ten groups and had volunteers lead the circles in discussions and formulating ideas. Once the smaller groups convened, the facilitators went over the “rules” of the circles, such as agreeing to only one person speaking at a time, to listening to others, to speak respectfully, to not swear, etc. Just before the forum began. Then each circle member had a chance to discuss, briefly, their likes and dislikes of OB, how they’d like to see the community, what resources they thought were needed, and how to address the threat to peace for OB’s summer. Each circle also had a “scribe” who busily jotted down what people said. All these notes were then later transferred to large sheets for everyone to see. Hamlin brought the crowd back from its smaller sessions and said that “there will be two or three more of these forums.” Applause, and the tired crowd got up to go. It was past 10. But the first community forum had been a success. Most of the large crowd stayed put and participated for the entire two hours. No solutions had been reached, but everyone – including the homeless who had attended – had the opportunity to speak their piece. The forum was definitely a positive step in healing Ocean Beach – and it was an historic moment in which the community that had been in the news so much lately over divisive issues such as the ‘bum’ sticker – pulled itself together. At least for one night. We’ll post more updates and reflections of the forum in the near future. Wow. This sounds like a terrific meeting. I’m sorry that I was unable to make it but glad to hear there will be more. The structure and facilitation seem very productive and I really like that the focus takes a broader look at life in OB. Thanks for this report. In my group was a guy named James, he loves OB loves the vibe and all the same things most people love about OB. When asked the 2nd question in the 2rd round ……What resources do we need to make OB the kind od community you desire ? He said ….More Services…..a bigger and better community center. After he fininshed and I got the peace rock ( you had to have the rock to speak ) I asked him if he followed City politics at all…I told him the City is broke. And city officials have been fighting over shelters for 10 years now and don’t wait on the City because it is not going to happen. Then I told him there are 50 organizations that help the homeless around San Diego they might not be in OB but they are out there…. So it seems the # 1 complaiant from the homeless is services….showers, bathrooms, sleeping ….at least thats what I heard. Nice summation of this gathering of community. I thought it was a very positive and productive meeting. No solutions…yet… but some real progress made in building trust, respect and partnership amongst the citizens of OB! it was good to hear from others others that night who agreed that crimes of violence, whether committed by a homeless person, a resident, a tourist, or other stakeholder in the community, was the real issue at hand … not simply all homeless that come to/through OB. Okay, maybe in my enthusiasm I over-estimated the crowd. I did take Jack Hamlin’s estimate of 200 and added to it, as he had said almost two dozen left at the very beginning. Plus there were folks outside that are not pictured in the photos. So maybe it was closer to 200 than 250. Unofficial headcount was 235 when the meeting started, SRO. I saw about 20, keyword about, head for the door when the process was described. It could have been more. Another twenty or so hung out by the door. Official sign in sheet was 192. There were ten circles with an average of 15 in the circles, a couple had 17, so we had approximately 155 participants. I was unable to see how many people were out in front of the hall, but I had the impression there were a few out there as well. We also had approximately 15 people arrive late who either found a group or waited until round two of the circle. Regardless of the number, I belive we had a good cross section of the community, and a sufficient number of participants to indicate we are an active and diverse community constituted by people who are willing to work together when given the opportunity. I applaud you all…. I just wanted to post a comment here to let everyone know I am going through pages of notes, distilling your thoughts and ideas which came out of the forum. It will take me a few days and I will probably have a report in the middle of next week. We had young people (did you know a couple of our scribes were only 14 years old?) and we had our seniors…some of whom were in their 90’s. Business owners, residents who live under roofs and without, we had people who do not live in the community among us and it was their first taste of Ocean Beach (our facilitators), we even had a stymied media which was unsure of how to report on an evening collaboration, reconciliation and peace. As the evening came to close, no one bolted for the door. We lingered in groups, still talking with each other, smiling…and the hugs and handshakes marked a turning point, a postive one in which many of you are ready for the work ahead. Years ago, when I patrolled our streets, my fellow officers would call OB, “Where the debris meets the sea.” Admittedly I found some humor in the monicker. No more…she is once again a gem to me…an odd one, but a gem nonetheless. Thank you all, each and everyone of you who came and shared and reminded OB of who she really is. To whom it may concern: we do not post comments if they are dehumanizing and uncivil. You can disagree with any article or other comment but please do so without demonizing the author, calling them names or putting them down in a personal manner. Do not expect your comment(s) to be approved if you do not leave a valid email or other contact information. You may post anonymously but you must give us an actual contact – that will remain private. Your email address cannot be seen by our readers, just our staff. Freedom of speech is an issue between the citizens and their government. As this is a private blog/ website – we do not receive any government (or corporate) monies and a business (although not a money-making business) we have the right to monitor comments and delete those that violate our commenting rules.